How South Africa’s Devil’s Peak is leading the pack. A short 30-minute drive from the centre of Cape Town, we find ourselves at the home of Devil’s Peak Brewing in Epping. Now at six years old, this is by far the leading craft brewer in the country and the main reason for our visit. With a wide range of their beers featured in this month’s box, we’re excited to be visiting their state of the art facility to find out more about what they’re up to. Showing us around for the morning is one of the founders Russell Boltman, who takes care of sales and marketing. We’re also joined by JC Steyn, the head brewer. Their Co-Founder, Derek Szabo is taking a well-earned vacation from managing their production and supply chain at the time of our visit. “Derek and I used to be IT guys and spent a lot of time in the US. It was easy to see that what was happening with beer there would soon travel around the world,” Russell explains. From there, the story follows a familiar path. “At first, we were brewing on what was just a glorified, gas-powered homebrew kit,” JC laughs. In July 2016, Derek and Russell joined the business in a full-time capacity and the rest, as they say, is history. JC proudly shows us their German-built Brewhouse, 500,000 litres of fermentation capacity and top of the range whirlpool, yeast propagator and filtration plant that he has to play with these days. It’s clear to see that the brewery has reached a considerable scale in a relatively short time and he explains that they hope this purpose-built facility will give them enough room to grow for the next decade. The King’s Blockhouse was the first IPA in South Africa and has consistently been the highest rated beer in the country. At the time it launched, this hoppy IPA put them at the cutting edge of brewing in the region. “The marketing dominance of SAB had got people thinking that beer was just something to quench your thirst,” Russell explains. But by then at least some consumers had started to search out beers with more interesting flavours. SAB’s market share had begun its decline, albeit from the eye-wateringly high ninety percentiles to the high eighties. Over a tasting tray of their full line-up, Russell walks us through how he sees that unfolding for the average South African beer drinker. After becoming comfortable with the Devil’s Peak brand through their lager, they hope that drinkers will transition to their Pale, then ultimately the 6% King’s Blockhouse IPA and eventually perhaps venture into their saisons, collaborations and more limited releases. “For a long time, the beer drinker has felt inferior to their friends when they go along to a braai (a South African BBQ) with their six pack of beers,” Russell says. With everyone else talking about the aromas and terroirs of their expensive wines, the beer drinker felt left out. “What we’ve been doing is putting beer back onto the table,” he goes on to say. Now, it’s just as acceptable to go along to a dinner party or a braai with a selection of craft beers as it is to take a bottle of wine. Although most South African beer drinkers may not be familiar with what exactly a sour or barrel-aged beer is, building credibility among those that do is very important to Russell and his team. It also helps that the higher ABV, more expensive styles that they have become adept at producing are more suitable for export, a key part of their strategy. As times have evolved in the South African craft beer market, more and more innovative brewers have started opening shop. Devil’s Peak are continuing to work hard to be ahead of the curve in terms of quality and the styles they produce. They were the first craft brewer in South Africa to can their beers, for example. Walking us through his barrel-ageing program, JC describes this wing of the brewery as his playground. Preferring not to use new oak barrels, which tend to impart too much of a woody note into the finished beer, these friendships with wineries are important. Some of the most exciting beers coming out of Devil’s Peak are their beer and wine hybrids. JC explains that they add some 20% unfermented grape must to their saison and then age it in wine barrels that have been inoculated with brettanomyces and lactobacillus. We discover that this creates a sour yet delicate flavour profile that is reminiscent of white wine, of course, but that is something quite special and unique in its own right. On the difference between working with wine rather than beer, JC tells us that there’s a lot more scope to be creative within beer. “A lot about wine is controlled by the governing body, but in beer you are free to do whatever you want – whatever you think will taste interesting.” He goes on to show us a barrel that has been ageing a saison for a year and another that contains a 3.5% sour, “A personal project of one of our brewers,” he explains. Settling down for the afternoon in their stylish on-site taproom, we order up some lunch and Russell furnishes us with some of their latest creations from their small batch Explorer Series. We taste their South African Wild Honey Saison, which has the characteristic dry spiciness you’d expect from the style, but with tantalisingly delicate floral notes thanks to the incredibly diverse flora that the local bee population feeds on. Known as the ‘Fynbos’, the Cape biosphere is one of the most diverse and interesting anywhere on Earth. Having travelled on his own time to iconic breweries like California’s Russian River and Treehouse and Trillium on the East Coast, Russell saw first-hand how limited releases and scarcity could work within beer. Now, at 12pm on the last Thursday of every month, the brewery releases a new and eagerly anticipated beer as part of this series. Working with South African illustrator Adam Hill, Devil’s Peak have created an exciting canvas for his work by having him design the labels for these monthly limited releases. Being limited in volume means that the brewers can also explore their African identity in new ways. We taste a beer that includes juice from the naartjie fruit, which Russell explains to us is an indigenous citrus fruit, smaller and tarter than an orange. We have an idea to produce a range of beers in homage to some of the greats of Afro-Funk, like Fela Kuti and others. “Although you could say that being based in Cape Town we are more exposed to European influences, we are hugely inspired by African creativity and the black cultures from the rest of South Africa and the continent at large,” Russell says. “Although we shouldn’t forget some of our European influences and heritage, there’s a lot to be inspired about from across Africa,” he says, clearly enthused by his own travels and friends he has made from different communities. “Up in Jo’burg, it’s like this huge African melting pot. It has this young, beating creative heart called Braamfontein,” he tells us. Having spent time making friends and getting to know the community there, a lot of his experiences within this predominantly black, younger community have informed Devil’s Peak’s recent brand developments. As well as drawing very real inspiration from their African surroundings, Devil’s Peak are a prolific collaborator with brewers from home and abroad. The list has included the likes of New Belgium, Fierce, Amundsen, Dugges, Fourpure and Lervig. These joint brewing projects with international brewers bring exciting new beers for them to introduce to South Africa, such as their ‘Capenhagen’ collaboration with Mikkeller. “I traded various names with Mikkel over email until we found one that just worked,” Russell tells us. It went on to win “Best Hoppy Beer” at the Cape Festival of Beer, the largest beer festival in the Southern Hemisphere. At the time of our visit, the team are getting ready to send eight of their most exciting beers to date to the Mikkeller Beer Celebration Copenhagen festival, all with African inspiration behind them. Visibly excited to be pouring their beers at one of the most highly-regarded events in the beer calendar, meeting the other participating brewers from around the world is also one of the big draws. “Being down here at the very Southern-most tip of Africa sometimes means that we have to go the extra mile to get exposure within the craft beer community,” Russell admits. They have been brewing beers from Scotland’s Fierce for the South African market, a relationship that originally began as a collaboration. “One of the founders had lived in South Africa for a couple of years, so there was a natural affinity with the idea of working together,” Russell tells us. Another fortuitous connection came in the form of Norway’s Amundsen’s founder also being a South African. These international collaborations have given Devil’s Peak considerable clout, opening many doors to help them to sell their beer overseas, especially in the UK. At home, a big part of their philosophy is to start supporting the smaller local breweries. They have put their money where their mouth is and partnered with the likes of Little Wolf and St Francis. 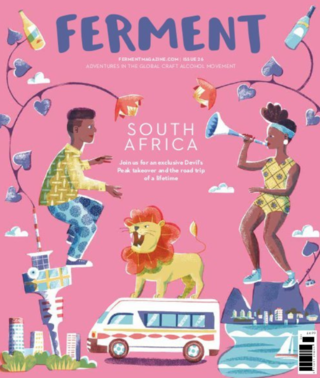 Keen to help gain some exposure within this issue for some of their other local peers, Russell volunteers Mitch Lockhart, who heads up the brewery’s social media to take us on a tour of some of Cape Town’s smaller breweries the following day.